The Mountain Goats’ John Darnielle is a contrarian by necessity, in the sense that he probably doesn’t know how to be anything else. The mondo literary songwriter’s independent streak has become something of a creative apparatus over his 17-year career, first producing a fiercely underground boombox-recorded canon split between cassettes, 7-inches and compilations, and lately a series of increasingly polished studio recordings for the 4AD label. The newest, Heretic Pride, follows several albums that might be characterized by one phrase apiece: Florida alcoholics on the verge of divorce (2003’s Tallahassee), Portland speed freaks (2004’s We Shall All Be Healed), the abusive stepfather (2005’s The Sunset Tree) and the sad one (2006’s Get Lonely). Each could be, on first listen, somewhat repulsive to a previous Mountain Goats fan; the sound of Darnielle painting himself into a corner. Usually, though, after repeated plays, Darnielle’s pinched, precise voice had soared triumphant from its seemingly wussy confines to confirm the music’s worth, just as it did when moored by analog hiss. Cellos are the new punk, it seems. So it is with Heretic Pride, which drops the listener back into the familiar world of Darnielle’s steady collaborators— producer John Vanderslice, bassist Peter Hughes, pianist Franklin Bruno and cellist Erik Friedlander. Darnielle himself is a narrator as instantly recognizable as Raymond Carver or Charles Bukowski, his primary subject being doomed relationships, his primary architectural tool being a strident acoustic guitar. As always, he’s prone to melodrama (“I am coming home to you, with my own blood in my mouth ... if it’s the last thing that I do,” he sings on lead track “Sax Rohmer #2”); lush, writerly detail (“when we cracked the windows open, well, the air was just so sweet, we could hear the cars ten feet away, out there on the street,” from “So Desperate”); and unaccountable tenderness (“hand me your hand, let me look into your eyes, as my last chance to feel human begins to vaporize,” on “Autoclave,” the obvious single). The first few listens reveal familiar questionable choices about the music itself. The literal Jamaican rhythms that punctuate “Sept 15 1983” (about the death of reggae singer Prince Far I, it’s a conceptual companion to 2005’s “Song For Dennis Brown”) seem out of place in the midst of an otherwise normal Darnielle strum. Likewise, the mega-peppy drums behind “Autoclave” and “Heretic Pride” (recalling fellow contrarian Mike Doughty) distract at first with their innocuous sound, as do the big Hammond swells of “New Zion.” Even in his most ornery cassette-era rulemaking, Darnielle was rarely orthodox, employing small keyboards, drum machines and even backing bands when necessary. 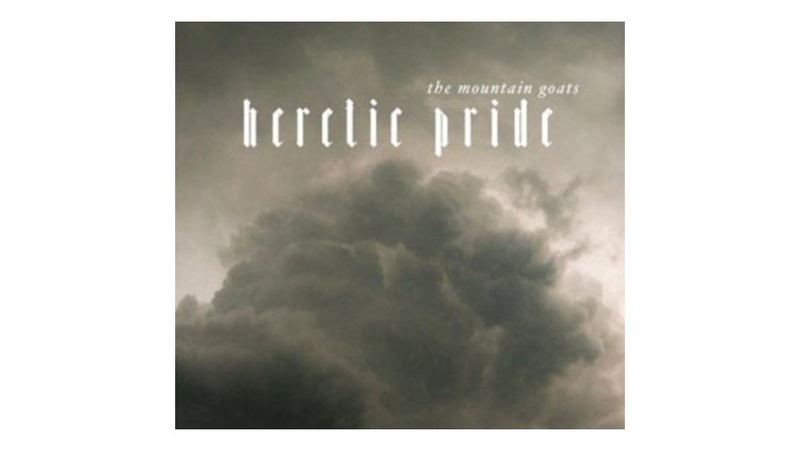 As one might expect, Darnielle’s voice and words center each song— on Heretic and elsewhere in his vast catalog—signifying them as Mountain Goats creations. Given his interest in finding new settings for himself (on “San Bernardino,” his singing is accompanied only by Friedlander’s cello), this is actually an affirmation: Darnielle’s sense of The Mountain Goats isn’t very different from most listeners’, despite his go-the-other-way tendencies. Still, Darnielle’s stylistic crutches dim the overall impact. Sometimes the songs (inadvertently?) reflect one another. For example, “Sax Rohmer #2” recalls 2006’s “Half Dead” in its phrasing and word choice. “Dead languages on our tongue,” he sings on “San Bernardino”; “molasses on my tongue,” on “How To Embrace A Swamp Creature”; “jasmine on my tongue,” on “Heretic Pride” (and all this after the “scotch rich on my tongue” from 2005’s “This Year”). The repetition is distracting, but it represents one of Darnielle’s healthiest instincts—the push and pull between staying true to himself and attempting to give his voice fresh context—even if the arrangements’ only function is to fall away and let him be himself. Darnielle’s music is of an old idea: a lifelong, self-strengthening dialogue. By his very nature, he rejects the new in favor of tastefulness. He’s got a guitar, a voice and a cellist. But his idea is a modern one, too—the fully Googleable product of a contemporary polymath. WTF is an autoclave? (A machine used to sterilize surgical instruments.) WTF is proto-sci-fi writer H.P. Lovecraft doing in Brooklyn? (Bugging out over the racial diversity and getting even more grotesque.) WTF happened on September 15, 1983? (Prince Far I died in Jamaica.) WTF does the title of the album’s loveliest song reference a Swedish black metal band? (’Cause it does.) Perhaps all parts of Darnielle’s personal cosmology, these are metaphors available only to citizens of the world, feet situated in the rolling data currents. Heretic Pride is music that would like to exist in all places at all times, equally understood as a triangulated constellation of references and as a set of disconnected proper nouns on which only the songwriter seems fixated. Ironically, the more precise Darnielle is, the more mysterious his characters’ displaced emotional power becomes. Affected? Totally. Complex and worth repeated listens? Hell yeah. After four vaguely conceptual LPs, Heretic Pride is an album in an almost literal sense—a collection of ideas, broadly bound—and one merely has to trust that Darnielle knows what he needs. That’s the thing about contrarians. They’re usually right.